Jennifer Shipp is Senior Counsel at the William and Flora Hewlett Foundation. She provides legal support for the programmatic work of the foundation’s Global Development and Population program. Additionally, she is responsible for managing legal issues for the foundation’s information technology team and international grants management. Previously, Jennifer worked at Arabella Advisors supporting its work with New Venture Fund and at the David and Lucile Packard Foundation, both in its Children, Families, and Communities program and Office of the General Counsel. Earlier in her career, Jennifer worked at two U.S. law firms, Morrison & Foerster LLP and Simpson Thacher & Barlett LLP, where she focused on corporate finance transactions. Jennifer is originally from the East Coast and is enjoying California. 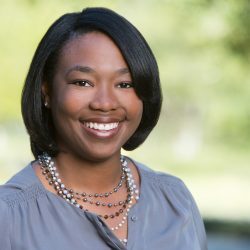 She has a bachelor’s degree from Emory University, a master’s in public policy from University of California, Berkeley, and a law degree from Howard University School of Law. She is a member of both the New York Bar and the California Bar.